Malaria is an infectious life-threatening disease, caused by single-celled Plasmodium parasites. In 2016, malaria was responsible for nearly half a million deaths globally, with 91% occurring across Africa (WHO, 2017). Most of these deaths were in children under the age of five (Unicef, 2018). 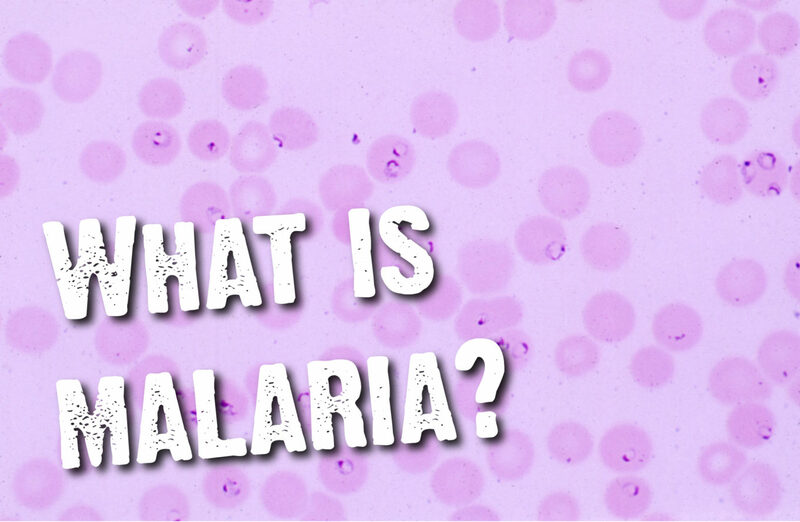 Malaria is a vector-borne disease, as it is transmitted by an infected mosquito vector, which releases the Plasmodium upon taking a blood meal. The vector of malaria is the Anopheles mosquito. Only female mosquitoes are capable of malaria transmission, because they need a blood meal to provide nutrients for egg development. Figure 1. Female anopheles mosquito taking a blood meal. Of these species, P. falciparum and P. vivax pose the greatest threat to humans, with P. falciparum accounting for 99% of estimated malaria cases in sub-Saharan Africa in 2016, and P. vivax being the predominant parasite in the Americas (WHO 2017). Plasmodium knowlesi is the only species that can be spread in the wild between humans and other primates (certain species of macaque from south-east Asia). In 2008 it was discovered that P. knowlesi was being misidentified as P. malariae in Malaysian Borneo (Cox-Singh et al. 2008). 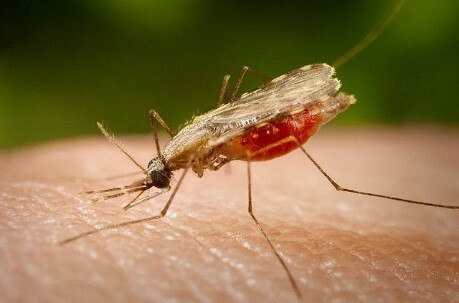 It only takes one bite from an infected mosquito for a person to contract malaria. Early symptoms include shivers, fever, headaches, vomiting, sweating and fatigue. These attacks occur every two days with P. falciparum, P. ovale and P. vivax, and every third day with P. malariae (CDC, 2015). Severe malaria is a medical emergency which predominantly results from infection with P. falciparum. These infections can progress into cerebral malaria, severe anaemia and renal failure. If left untreated they may result in death within 24 hours. When a person is bitten by an infected mosquito, juvenile Plasmodium parasites move from the mosquito salivary glands to the host’s liver cells, where they mature. The parasites then burst from the liver cells and migrate into red blood cells, where they differentiate into specialised male or female cells called gametocytes. The gametocytes circulate in the blood and are picked up by a female Anopheles mosquito taking a blood meal. The gametocytes then join to reproduce. Juvenile stages then move to the mosquito salivary glands, and from here they can be delivered to a human during a subsequent blood meal. Malaria is preventable and treatable; since 1955, twenty-two countries and two territories have successfully eliminated malaria (WHO, 2016). 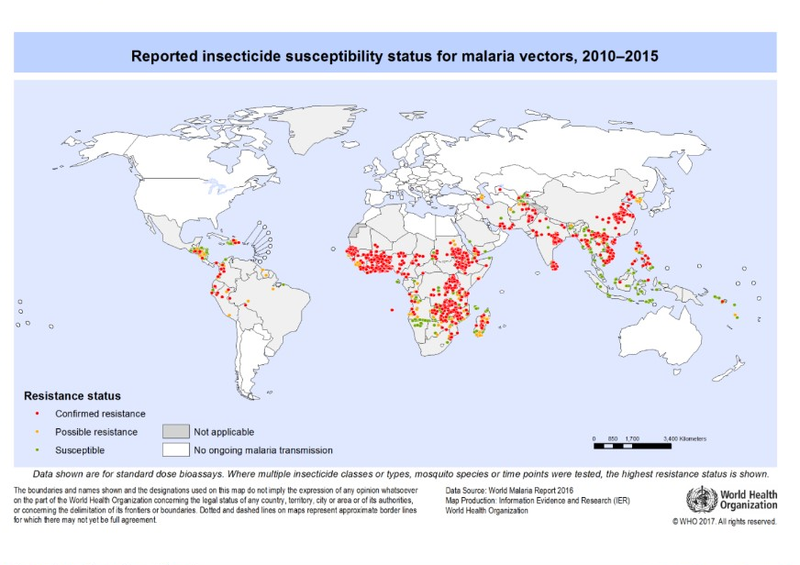 To successfully control malaria, we must monitor its prevalence through surveillance. Malaria infections are diagnosed by microscopy of blood films and rapid diagnostic tests (RDTs). Sound reporting aids interventions. The most common anti-malarial treatments are artemisinin-based combination therapies (ACTs), although chloroquine is still used for some P.vivax and P. ovale infections. Intermittent preventative antimalarial therapy is also recommended for pregnant women, who are at a higher risk from the disease. A large part of malaria elimination efforts also focus on mosquito control, through the distribution of insecticide treated bed nets (ITNs) and Indoor residual spraying of insecticides. As we work towards ambitious targets to reduce 90% of malaria deaths and cases by 2030, several challenges persist. Funding efforts must be consistent to ensure resource distribution, and new drug and insecticide research can continue. This is essential given that many malaria endemic countries have reported mosquito resistance to one or more type of insecticide (Figure 2). Likewise, the Plasmodium parasite has also developed resistance to some antimalarial drugs. This means that both insecticides and drugs need to be rotated carefully in interventions. Malaria interventions must also focus on behaviour change, so that control is maintained through the correct use of nets, RDTs and treatments. Cox-Singh, J., Davis, T.M. and Lee, K.S. et al. (2008). Plasmodium knowlesi malaria in humans is widely distributed and potentially life threatening. Clinical infectious diseases. 46(2):pp.165-171.